“Phase Space” promptly removed our minds from our skulls and put them in a dreamlike state. 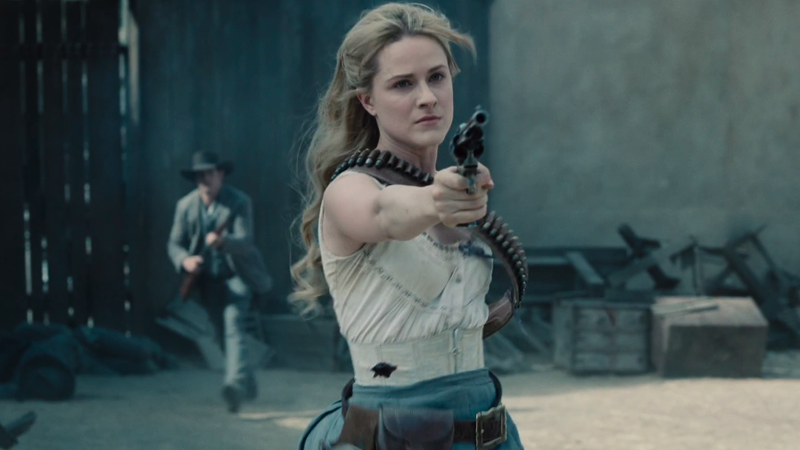 Craig and Jess discuss “Previously on Westworld” (2:29), the happenings of Delos (3:42), Dolores and Teddy on the crazy train (13:32), the Man in Black reconnecting with his daughter (27:58), Maeve slicing and dicing her way to freedom (48:09), and Bernard in the cradle (1:07:01). Just when you thought it couldn’t get any better, “Phase Space” blew away our expectations yet again! Craig and Meredith discuss this fantastic, surprise-filled episode (0:35) before talking about their favorite moments (20:26). Samurai and ninja and impalings, oh my! “Akane No Mai” was an incredible introduction to Shogunworld. Craig and Brian discuss the Delos cleanup crew (3:58), Dolores and Teddy’s heartbreaking journey back to Sweetwater (11:42), and Maeve and company’s journey through feudal Japan (35:43). Shogun World was everything we’d hoped it would be and more. While we’re all recovering from that incredible episode, Craig and Jess discuss the beautiful and brutal ‘Akane No Mai’ (3:23) before talking about their favorite moments (24:48). We’re still recovering from what might be the best episode yet (we feel like we’re saying that a lot these days). After a brief discussion about the episode in general, Craig and Meredith discuss Delos’ disturbing experiment (8:28), the Man in Black on the path to glory (36:29), and Bernard and Elsie’s horrific adventure (1:04:55). We’ve seen western. We’ve seen sci-fi. This time we saw Westworld go pure horror and it was glorious. Lisa Joy did not come to play for her directorial debut. Craig and Jake discuss ‘The Riddle of the Sphinx’ and its many layers (2:17) before talking about their favorite moments (18:39). The third episode of Westworld Season 2 was certainly full of virtue and fortune. Craig and Brian dive deep into ‘Virtù e Fortuna’ to discuss adventures in The Raj (3:19), Maeve finding new and old friends (21:12), Dolores on a warpath (42:31), and crazy theories (1:34:43). Holy crap. What an episode. Craig and Meredith discuss a fun Westworld conspiracy from last week’s episode (0:50). Then they recap “Virtù e Fortuna” (3:26) before discussing their favorite moments (18:25). The second episode of Season 2 might be one of the best in the whole series. Craig and Jake dive deep into “Reunion” to discuss the Man in Black and Lawrence (4:47) and Dolores’ history of espionage (34:06). That was one heck of a reunion! Craig and Meredith discuss a few things they missed from last week (0:58). Then they jump into a quick breakdown of episode two, ‘Reunion’ (5:54) before discussing their favorite moments (16:59). It’s time to dive deep into “Journey Into Night.” Craig and Meredith talk about the show’s new intro (3:56), the Man in Black starting his new journey (7:11), Dolores’ pension for violence (15:24), Maeve and Sizemore’s wacky adventures (27:47), and Bernard on a distant shore (38:50). It’s here! The premiere of Season 2 has arrived and we are so excited to talk about ‘Journey Into Night.’ Craig and Meredith give a quick recap (2:29) and then discuss a few of their favorite moments (7:58). We are just one day away from the premiere! If you’re trying to catch up on Season 1 before Season 2, we’ve got you covered. We recapped all 10 Season 1 episodes and you can listen to them all right here. Make sure you subscribe to follow our podcast for all of Season 2! We’re rewatching all 10 episodes of Season 1 in preparation for the Season 2 premiere. Craig and Meredith discuss the epic trolling from Jonathan Nolan and Lisa Joy (0:55). Then they recap “The Well-Tempered Clavier” (6:53), discuss the episode’s theme: awakening (48:18), and break out the trusty old six shooter and discuss six things you might have missed upon your first viewing (51:03). We’re rewatching all 10 episodes of Season 1 in preparation for the Season 2 premiere. Craig and Meredith rewatched “The Well-Tempered Clavier” and after giving a synopsis (1:33), they discuss the episode’s theme: suffering (24:47), and break out the trusty old six shooter and discuss six things you might have missed upon your first viewing (31:20). We’re rewatching all 10 episodes of Season 1 in preparation for the Season 2 premiere. Craig and Meredith rewatched “Trace Decay” and after giving a synopsis (1:49), they discuss the episode’s theme: pretending (35:04), and break out the trusty old six shooter and discuss six things you might have missed upon your first viewing (39:23). We’re rewatching all 10 episodes of Season 1 in preparation for the Season 2 premiere. Craig and Meredith rewatched “Trompe L’Oeil” and after giving a synopsis (1:51), they discuss the episode’s theme: pretending (31:59), and break out the trusty old six shooter and discuss six things you might have missed upon your first viewing (34:40). We’re rewatching all 10 episodes of Season 1 in preparation for the Season 2 premiere. Craig, Meredith, and Brian rewatched “The Adversary” and after giving a synopsis (1:40), they discuss the episode’s theme: secrecy (36:35), and break out the trusty old six shooter and discuss six things you might have missed upon your first viewing (39:12). We’re rewatching all 10 episodes of Season 1 in preparation for the Season 2 premiere. Craig, Meredith, and Brian rewatched “Contrapasso” and after giving a synopsis (1:41), they discuss the episode’s theme: self-realization (45:22), and break out the trusty old six shooter and discuss six things you might have missed upon your first viewing (48:33). We’re rewatching all 10 episodes of Season 1 in preparation for the Season 2 premiere. Craig, Meredith, and Brian rewatched “Dissonance Theory” and after giving a synopsis (2:24), they discuss the episode’s theme: control (33:36), and break out the trusty old six shooter and discuss six things you might have missed upon your first viewing (37:36).